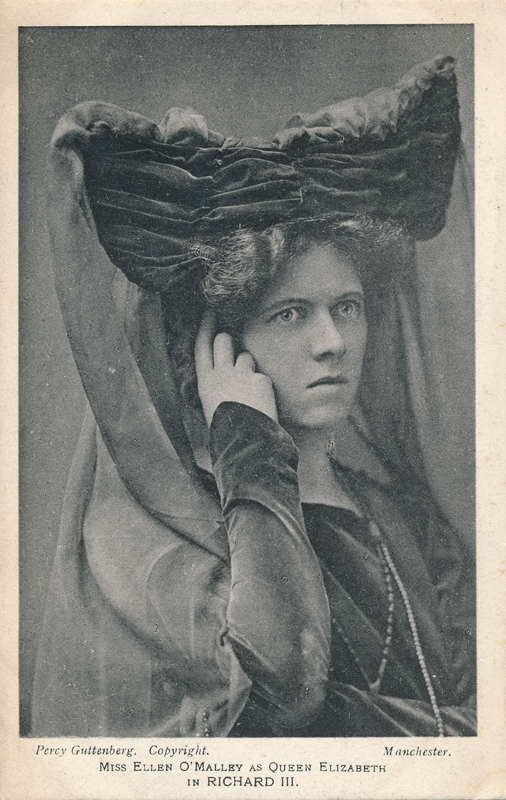 Ellen O’Malley was born in Dublin and made her stage debut in 1898 at the Theatre Royale, Margate. Her first part in a Shakespeare play was as Queen Elizabeth in Richard Flanagan’s June, 1904, production of Richard III. Her next part was as Sylvia in The Two Gentlemen of Verona (1904). In 1911, after playing Cordelia in King Lear in 1909 at the Haymarket Theatre, she joined the company of Sir Frank Benson, playing at Stratford and on tour. With Benson, she played Portia in The Merchant of Venice, Juliet, Lady Macbeth, Rosalind in As You Like It, and Katherine in The Taming of the Shrew. Her last two roles in Shakespeare are recorded as Ophelia in 1913 and Gertrude in 1917. She retired from the stage after her last performance in 1934.